A TwinOmatic is highly effective in removing suspended solids down to 50 micron, without flocculants, pre coats or granulated media. 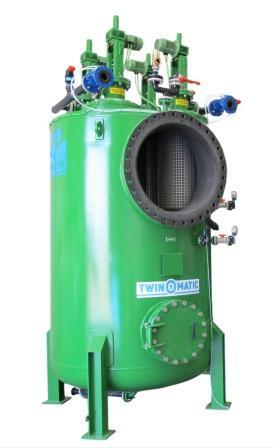 The TwinOmatic Mega is an efficient and reliable self-cleaning filter unit, designed to handle a higher flow due to a multiple screen design. Effective Cleaning of the total filtration area, even at minimum pressure. Minimum flush, less than 5% of the total flow is used for cleaning. Multiple screens for higher flow and larger filtration area. Automatically initiated self cleaning process. Uninterrupted flow and continuous filtration during cleaning.